Some 60 graduates from 10 African nations attended the Engineering Institute of Technology’s (EIT) 2018 African Graduation Gala, held recently in South Africa. The online learning platform reaches EIT students in their homelands around Africa, and indeed the world. 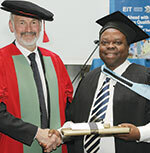 Graduates were addressed by the CEO of the South African Council of Engineering (ECSA), Sipho Madonsela and Johan Maartens, COO of The Society for Automation, Instrumentation, Measurement and Control (SAIMC), who both noted that with the Fourth Industrial Revolution in full swing, the work EIT is doing is invaluable. Steve Mackay (left) with Sipho Madonsela. Other speakers included EIT instructors Terry Cousins and Tom Neilings, who noted the speed with which technology is advancing since the advent of the Internet. EIT’s Dean of Engineering, Steve Mackay, honoured some of the college’s most dedicated students, while Graduate of the Year, Johannes Kapeuasha, joined proceedings via webcam and spoke about how EIT had contributed to his promotion from security guard to industrial security technician. The runner-up award for Graduate of the Year went to Jo-Ann Hogan. Student Ambassador of the Year, Tatenda Nherera, received his Advanced Diploma of Electrical and Instrumentation Engineering for Oil and Gas Facilities. He delivered a speech about the benefits of EIT’s distance learning philosophy and proudly vouched for its success and the fact that EIT’ understands that students are also working in the field while trying to complete their studies. Zimbabwe’s Algate Panyika Mtemah was named Honorary Student of the Year for the way he assisted fellow students transfer money from Zimbabwe to South Africa to pay for their tuition fees. The event concluded with lunch and a networking opportunity for the graduates in attendance.